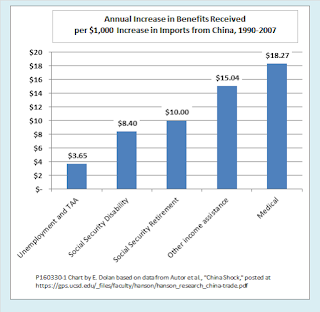 Ed Dolan's Econ Blog: How Reform of the Social Safety Net Could Mitigate the High Costs of Trade Adjustment: A Response to Autor et al. 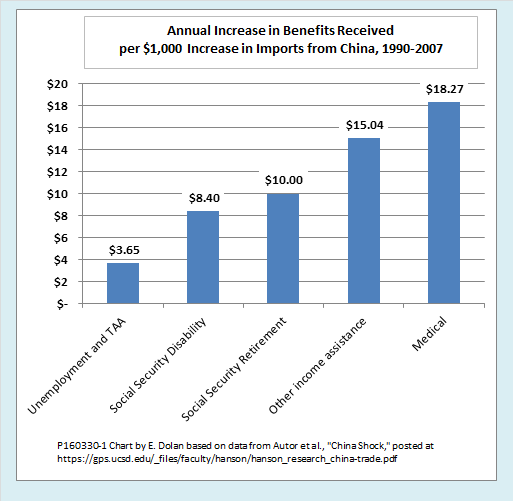 How Reform of the Social Safety Net Could Mitigate the High Costs of Trade Adjustment: A Response to Autor et al. The two most watched candidates of this presidential election season, Donald Trump and Bernie Sanders, have put anger over the effects of free trade at the center of their campaigns. In doing so, they have won millions of votes. Many of the arguments they use in their stump speeches are overly simplistic, but the anger is real. And, as Eduardo Porter noted recently, angry voters have a point: New research suggests that economists have long understated the costs of trade and underestimated the time required for the economy to adjust to the trade shocks that rapid growth of both US imports and exports have produced. If that research is correct, if free trade really causes more pain than we thought, what is the right policy response? Not protectionism, in my opinion, but there are measures we could and should take to ease the pain. Read on. Jared Bernstein, a Senior Fellow at the Center for Budget and Policy Priorities, points out that how we assess the balance between the costs and benefits of trade depends on whether we view people as consumers or as workers. Consumers benefit from free trade through lower prices and access to a wider variety of products. The impact on workers is more complex. Some lose jobs at factories that can no longer compete with imports. Waiters at local restaurants lose income when unemployed factory workers stop taking their families out to dinner. At the same time, new jobs open up as trade expands employment in export industries, and as lower prices of imported goods leave consumers with extra money to spend on local goods and services. The impact on workers depends to a large extent on whether those who lose their jobs to import competition can find their way to the new jobs created elsewhere. To take an example from my last post, suppose consumers save $1.1 billion from cheaper imported tires at the cost of 1,200 jobs lost in the tire industry. At more than $800,000 in gains to consumers per job lost, that sounds like a huge net gain for the economy as a whole. But is it a net gain for Joe, the tire worker? Not unless he quickly finds a new job as good, or nearly as good, as the one he lost. But what if Joe, after losing his job at age 45, never finds steady work again? What if has to get by for the rest of his life on odd-jobs, food stamps, and Social Security? If that is typical, then the net gains from trade in tires would be smaller, and the losses would be more concentrated on the directly affected industry and region, rather than spread widely via labor and product markets. The costs of trade shocks include both lower wages and loss of jobs, and persist for years. They are concentrated on workers in specific local labor markets. Labor mobility is not sufficient to ensure widespread sharing of losses by workers across regions and industries. Especially when an increase in the overall trade deficit accompanies a trade shock (as was the case for the China shock), workers displaced from jobs impacted by import competition do not quickly find comparable jobs in export industries. Those who do find work often end up in services or other sectors serving the domestic economy. Their skills do not fit those jobs, so their wages are lower. The persistent local effects of trade shocks include increased uptake of unemployment benefits, disability benefits, food stamps, and other forms of government assistance. Trade shocks disproportionately affect low-wage workers within affected regions and industries. 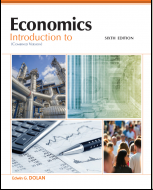 This paper has touched off a lively discussion among economists (some samples). Some of them say that we already knew these things, we just didn’t talk much about them. Others say just one article should not be taken as definitive. Still others will critique the paper’s models, methods, and data sources, as good fellow professionals should. The question I find most interesting, though, is what the appropriate policy response is, if, for the sake of discussion, we take the pessimistic conclusions of Autor and his colleagues at face value? One traditional response has been to offer some kind of social safety net to workers displaced by trade. The hope is that a mix of temporary income support, retraining, and help with job search and relocation could minimize the pain for the most affected individuals and regions, while ensuring that the costs of adjustment would be shared fairly by those who benefit from trade. Those are the intended goals of the federal Trade Adjustment Assistance program (TAA). Unfortunately, TAA has a poor reputation. Some critics think the program is too narrow and inadequately funded. They urge expansion of TAA. Others see eligibility criteria as too broad. They point to studies that show the training offered to be poorly designed and ineffective. For whatever reason, TAA clearly has not prevented the persistent adverse effects seen in the Autor study. For individual workers, each of these social programs may be part of the solution to trade-related job loss, but viewed as policy, they are part of the problem. The reason is that all of them carry strong disincentives to find new employment. The disincentives come from the fact that the programs automatically reduce beneifts as income rises. For example, the benefit reduction rate for a family’s food stamp benefits might be 20 percent, that is, a reduction of $20 for each $100 increase in income. Benefit reduction rates are additive, so that if the family also receives Medicaid, which has a benefit reduction rate of, say, 30 percent, the total benefit reduction rate would be 50 percent. Taxes, if any, are also additive. If there is a 7 percent payroll tax, then the total effective marginal tax rate would be 20 + 30 + 7 = 57 percent. The family’s net income, including both benefits and earned income, would increase by just $43 for each $100 earned. 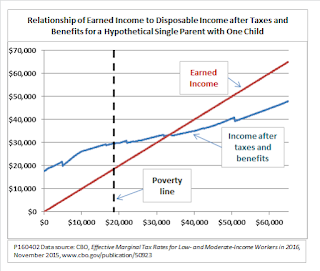 The following chart gives an example based on a single-parent family with one child living in Pennsylvania. It uses data from the Congressional Budget Office that take into account earned income, federal and state income and payroll taxes, food stamps (SNAP), cash welfare (TANF), and medical benefits including Medicaid, CHIP, and subsidies for exchange-purchased insurance under the Affordable Care Act (ACA). Notice that the earned income line is flattest in the range from just below the poverty level to twice the poverty level. From 120 to 125 percent of the poverty line, the effective marginal tax rate reaches 80 percent. There are also numerous “cliffs” where income after taxes and benefits drops suddenly because the family reaches a threshold of earned income beyond which some program cuts off entirely. For example, one such cliff occurs at an earned income of $21,900, a little above the poverty level. 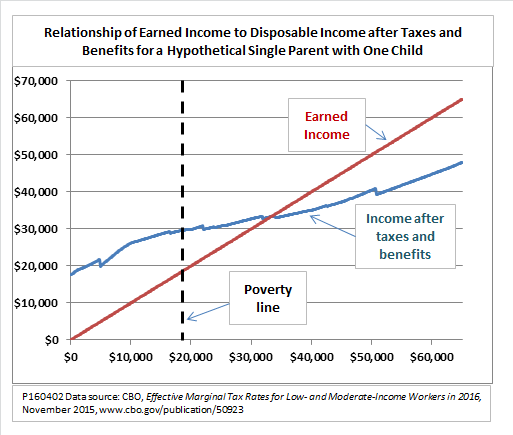 Just below that point, the family’s income after taxes and benefits reaches $30,800. Net income then falls by $1,000, and does not return to $30,800 until earned income reaches $25,100. Effective marginal tax rates vary according to family structure. Another study found that effective marginal tax rates are especially high for secondary earners in two-earner households. If childcare, transportation, and other work-related expenses are taken into account, it often does not pay at all for a second household member to take a job. That situation might very likely fit a family in which one spouse lost a factory job due to import competition while the other spouse retained a job as, say, a retail clerk. State-to-state variations in social safety net rules further undermine job search incentives for workers displaced by trade. So do disincentives in Social Security Disability Insurance, which some job losers turn to when their unemployment and TAA benefits run out. The bottom line is that when workers lose their jobs through trade, the social safety net eases their pain but, at the same time, reduces their incentives to seek new work. Congressman Paul Ryan has warned that the social safety net can become a hammock for those who receive its benefits. In the case of trade shocks, however, the safety net seems less of a hammock than a trap. What can be done to mitigate the way the social safety net impedes adjustment to trade shocks? I am sure there are many places where tinkering with the rules could help, but here are two proposals that are more radical than mere tinkering. One would be to move toward a system of universal health insurance that fully decouples coverage from employment, income, or place of residence. I discussed the advantages of such a system in this earlier post which discussed Sanders' "Medicare for all" proposal and contrasted the US healthcare system with those of other wealthy countries. Some people say that we don’t need a Euro-style healthcare system, since we now have the Affordable Care Act. The ACA has, in one respect, eased the pain for workers displaced by trade, in that people with pre-existing conditions are now able to purchase individual health insurance policies if they lose coverage from their employer. That is good in itself, but, at the same time, the ACA adds a new dimension to work disincentives. Those disincentives arise from the way the ACA subsidizes individual policies purchased on insurance exchanges. The subsidies are subject to a substantial benefit reduction rate that come on top of the benefit reductions already built into other means-tested programs. The exact benefit reduction rate for ACA insurance subsidies depends on income and family circumstances, but estimates based on industry-provided subsidy calculators suggest that something like 15 percent is typical. What is unusual about the ACA subsidies is not that the rate is so high, but that they extend further up the income scale than those of other income support programs. They do not entirely phase out until a household reaches 400 percent of the poverty level. That makes them relevant to workers even in relatively high-paid jobs and two-earner families, categories into which many workers displaced by trade would fall. For them, the ACA adds one more source of friction that contributes to slow labor market adjustment to trade shocks. A second radical proposal would be to replace existing means-tested social safety net programs of all kinds with a universal basic income (UBI). In place of TANF, SNAP, housing subsidies, childcare subsidies and everything else, a UBI would offer all citizens, young or old, rich or poor, a monthly cash grant that would be entirely independent of earnings or labor market status. Empirical research has repeatedly found that the substitution effect is far stronger than the income effect. Eliminate the tangle of overlapping social programs that give rise to 80 percent effective marginal tax rates for the poor and near poor, and you are sure to get greater work incentives. Those incentives would be especially important for workers displaced by trade who need to relocate and retrain for new jobs. In an earlier set of posts, I explored in detail the economics of a UBI and the effects of such a policy on work incentives. It is too long a story to retell here, but it is worth consideration. There is no one policy response that will fully assuage the anger, the pain, and the economic damage that trade shocks do to individuals and communities. Still, some approaches hold more promise than others. 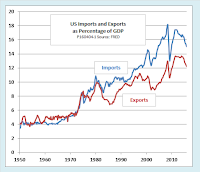 It is important to recognize that recent research like that of Autor and his colleagues does not directly challenge the classic economic argument that the total gains from trade are greater than the total costs. As they put it, “[Our] novel results do not at all suggest that international trade is in the aggregate harmful to nations.” Their point, instead, is that managing and mitigating the costs of trade adjustment deserve more attention from policymakers and applied economists. Protectionism, then, is not the answer. Repudiating free trade agreements and restoring high tariff barriers would avoid the costs of trade only by abandoning the benefits, which in the aggregate are larger. Reducing those costs by smoothing the path to trade adjustment and reforming the social safety net to spread remaining costs more justly makes more sense. In fact, a protectionist response taken now would only subject the economy to new dislocations. The original China shock, huge though it has been, has largely run its course, as Autor et al. acknowledge. Restoring tariffs and other trade barriers to their previous levels would, at this point, undermine the achievements of industries, regions, and individual workers who have, sometimes painfully, succeeded in relocating and retooling to meet the needs of a global economy. In order to restore the past industrial glories to which some romantics hark back, we would have to go through the whole painful adjustment process in reverse. Furthermore, whatever we do on the trade front, our economy will remain vulnerable to other major shocks that are already underway. Automation and artificial intelligence, for example, are making whole classes of jobs obsolete, as relentlessly as Chinese toys and T-shirts have done. At the same time, climate change is spurring a massive shift from fossil fuels to renewable energy, and may soon (if we believe the pessimists) require us to move entire cities inland to higher ground. Measures to improve the flexibility of labor markets and reforms of the social safety net will make it easier to cope with those shocks, too. 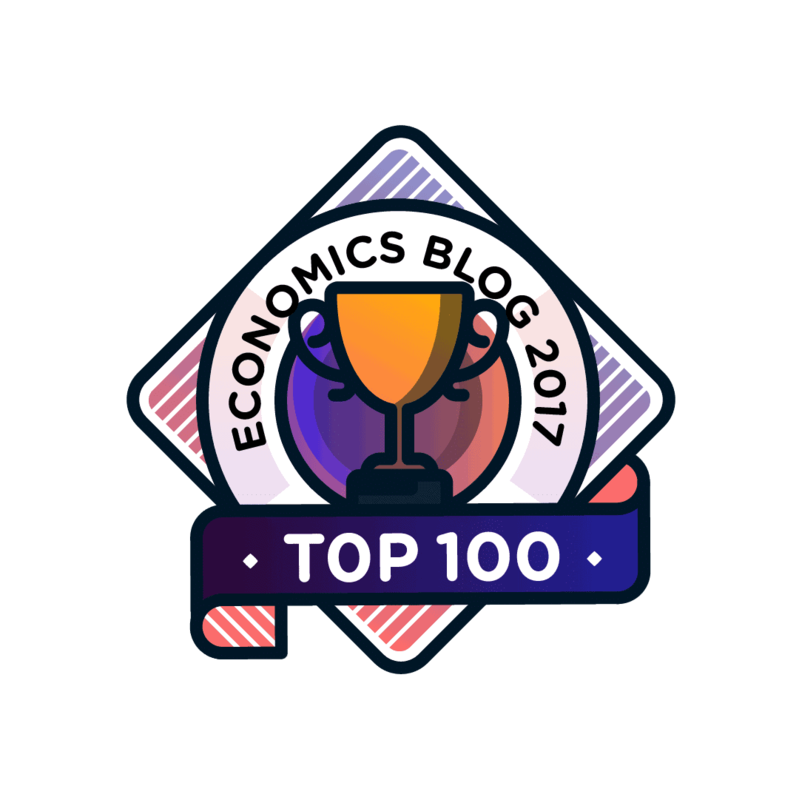 This post first appeared on Economonitor.com.